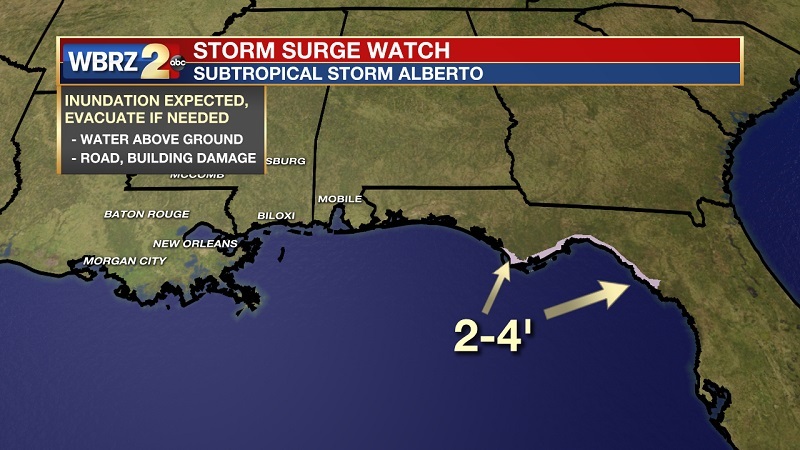 As of 1 PM Monday afternoon, Subtropical Storm Alberto was located 50 miles south-southwest of Panama City, Florida, with a minimum central pressure of 994mb and maximum sustained winds of 50mph and was moving north at 8mph. A quicker north-northwestward motion is expected over the next several days. 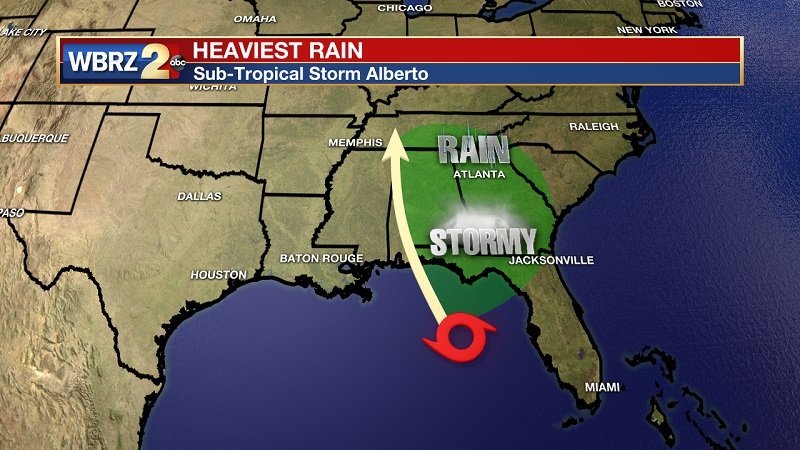 The center of Alberto will be making landfall later this afternoon just west of Panama City between 1-5 PM. Substantial rainfall amounts will extend from Florida through the Carolinas and into the north east toward the latter half of the week. Maximum sustained winds are near 50 mph, with higher gusts reaching outward, northward and toward the east. Gradual strengthening is forecast until the system reaches the northern Gulf Coast later today. Rainfall will be minimal across Louisiana, resulting in around .5" of rainfall through the event. Accumulations increase moving east along the Gulf Coast, with the Florida Panhandle picking up a potential 6-10" of rain into next weekend. Coverage of showers and thunderstorms will increase into the Memorial Day Weekend. A feed of tropical moisture will enhance rain. While outdoor events could be delayed due to rain and lightning, a total washout is not expected. If you have vacation plans east of Louisiana, be prepared for much higher impact weather and consider making some adjustments. 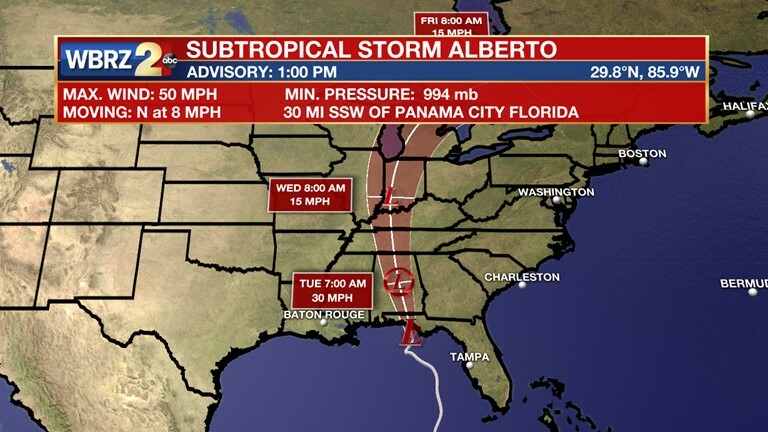 The Tropics: Subtropical Storm Alberto formed Friday, and is continuing to move north toward the panhandle of Florida. Pressure continued to drop overnight to 990mb, making it the lowest pressure for an Atlantic named storm during May since Subtropical Storm Alpha in 1972. Expecting landfall Monday Afternoon along the Alabama coast, with the majority of storm activity staying on the eastern side of the storm. Today and Tonight: Memorial Day will begin with mostly cloudy skies, and spotty showers through the day, peaking through the late afternoon hours. Showers and storms will be brief, just enough to cool temperatures off a bit. We will be breaking into the 80s by 10AM, eventually reaching a high of 89°. Showers will slow through the evening, as partly cloudy skies stay overhead. Temperatures will be slow to cool around 72° overnight. Up Next: Through the beginning of the workweek, isolated showers and thunderstorms will be off and on, enhanced by moisture from the Gulf of Mexico. As is typical with tropical thunderstorms, downpours will be possible and could result in nuisance flooding issues. In addition to what has already fallen, around .5 of an inch of rain is expected within the 13 Parish, 3 County WBRZ Weather forecast area, which would be manageable. Some isolated higher amounts are possible. 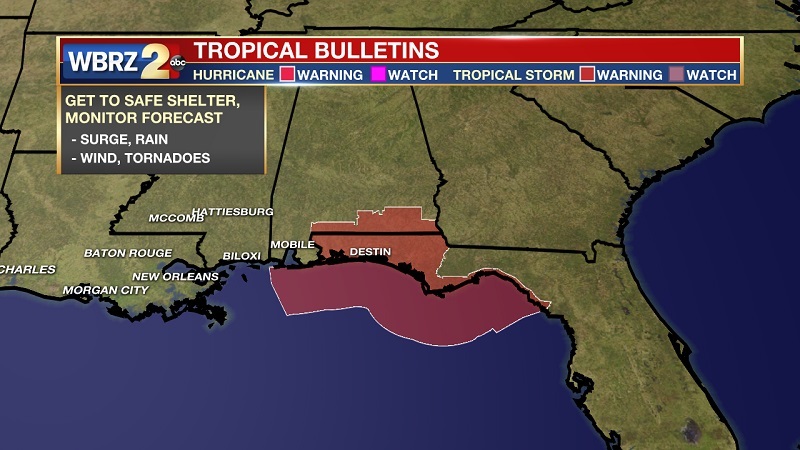 It appears that the highest totals will occur on the east side of the tropical system in Alabama and extending into Georgia and Northern Florida. Subtropical Storm Alberto is still rather ragged, due to dry air intrusion, most of the precipitation will occur east of the low pressure center. The GFS and the ECMWF model are in fairly good agreement, bringing the storm onshore near Pensacola, Florida on Monday afternoon. 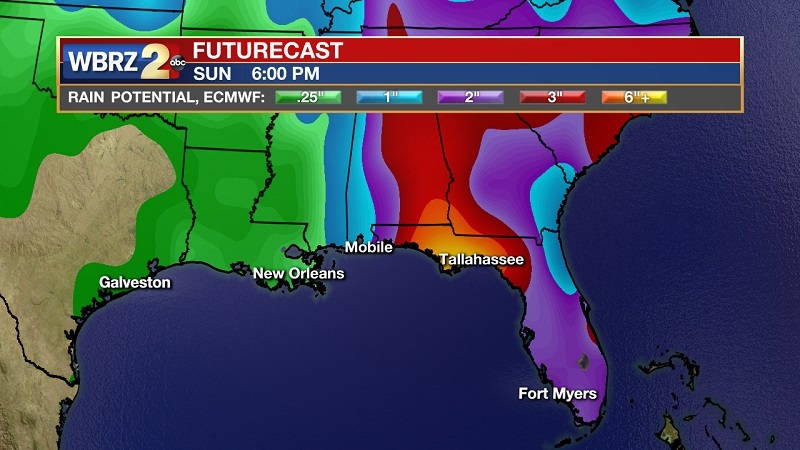 The Weather Prediction Center focuses the area of heaviest rain from Eastern Alabama eastward to the Florida panhandle and into Georgia. Isolated amounts upwards of 5-10 inches will be possible there. The 13 Parish, 3 County WBRZ Weather forecast area should receive around .5 of an inch of additional rain through Wednesday with isolated higher amounts. Spokes of energy pin wheeling around the low may result in some nighttime rain in addition to the traditional daytime precipitation cycle. The wet pattern should begin to lose its grip on the region and the low pressure dissipates by the middle or end of next week.